Quite simply, Irvine Access Floors (Irvine) is the world’s premier distributor of raised floor systems. 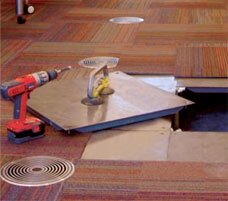 We are pioneers of the industry, dating back to the inception of access floors. Today, Irvine services its customers with the most experienced, reliable, and trustworthy team of professionals within the industry. Our customers can count on us every time to install any size floor, of any complexity, on-time, in-full and within budget. Our customers are our number one asset! Everything we do is focused on each project being successful – and this, in turn, helps our customers prosper. Ultimately, the success of Irvine depends on our ability to meet or exceed our customers’ expectations. We value Relationships, treating customers and suppliers as long-term partners and each other with candor and respect. We succeed through Performance, focusing on superior execution, optimized logistics and onsite productivity. We are “Made in America” and are therefore committed to offering the finest product and support structures in the world. And because of our family legacy and what we stand for, we do everything with Integrity.